About a year ago, I wrote about the number of stupid signs that have blossomed like ragweed across the land. One of those about which I wrote last time was on a gas pump at Sheetz. 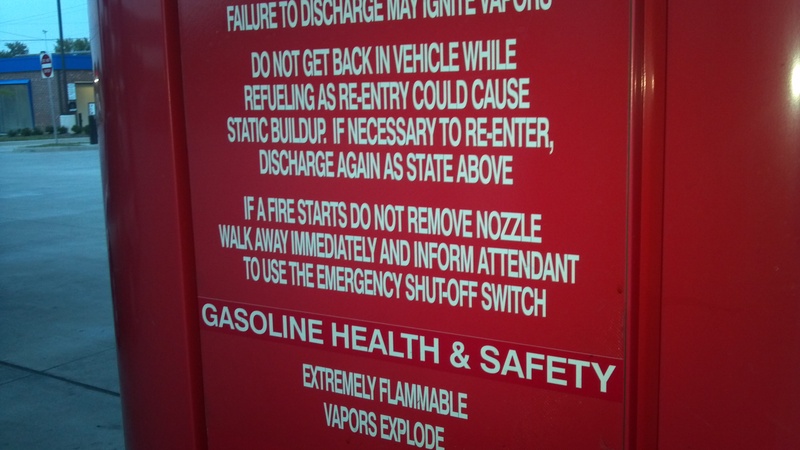 While pumping gas last week, at the very same Sheetz I might add, I saw another warning that gave me pause. Contemplate the second paragraph on the photo at right. As I understand this sign, if a fire erupts somewhere over 20,000 gallons of gasoline or whatever those underground tanks hold, I’m supposed to stroll on in and mention to Skippy behind the counter, that he might want to turn off the supply of gasoline before the expectant explosion hurls my automobile into the shopping center on the other side of the highway. If a fire starts, run like a crazed gazelle into the store and scream to Skippy behind the counter that he should hit the red switch and then duck. You should probably wave your arms will doing so. If you see a stupid sign out there, take a photo and post it in the comment section. This entry was posted in Life is Interesting, Uncategorized and tagged cashiers named Skippy, Sheetz, stupid signs. Bookmark the permalink. You (and the sign) assume Skippy isn’t too busy selling lotto tickets and cigs to attend to your minor emergency.